lauantai 20.04.2019 21-02, Tirra. liput 5 euroa. How hot and funky can it get in the Arctic? Who knows. But have a listen to Togetherings, the fourth studio album by Finnish-Beninese-Ethiopian rhythm music collective The Blassics. This album brings your ears a tight collection of musical journeys the nine-piece group has achieved through the delicate art of listening. Involving both more planned original compositions (e.g., Hagerun Geleba) and material improvised from scratch (e.g., Why is the Chicken Running?) Togetherings works as a reminder on the importance of music in cultivating joy, tenderness and hanging out, without forgetting the complexities involved. 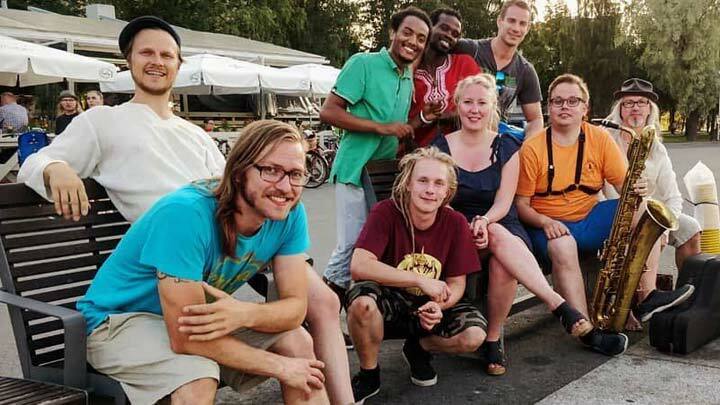 Started as a production duo by two funk aficionados (Sarkkola and Tammi) who primarily draw their inspiration from record collecting, deejaying and jamming, The Blassics have grown during the past years to be one of the most prominent Finnish-afro-funk-jazz collectives. Played live at Odd Funk Records’ analogue studio in Hämeenlinna, the album cherishes the roots of deep and spacey funk, afro and jazz with Arctic seasoning and crispy tape sound. Mastering done by Jukka Sarapää at Timmion gives this Blassical masterpiece the ultimate audio icing. Togetherings is released as a limited edition vinyl of 500 copies by Odd Funk Records (oddfunk011) on 30th of April 2019. The record is distributed worldwide by Painted Dog Records. Digitalized version of the album will be available through various platforms and services.